There is a consultation open until 30th October 2017 about some proposals for improvement of Clerkenwell Green, one of which is a statue of Sylvia Pankhurst. Great woman but is this the right place…have your say! See consultation here. After the atrocity of the Grenfell Tower fire, among the agendas being peddled by different factions in the media members of the MPA and MP Neighbourhood Forum were appalled to see Simon Jenkins citing Mount Pleasant in his anti-tower block diatribe this week. This large re-development project received planning permission in February. 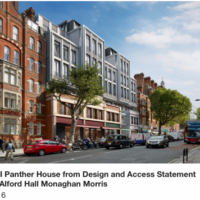 MPA was involved with local residents and people renting studios and workshops in Panther House.